St. Patrick's Day is upon us -- our annual opportunity to pay respect to the patron saint of Ireland. And to honor this man and his anti-snake agenda, churches across America fill with people seeking quiet reflection and a little knowledge of Irish tradition. Ok, no. Wait. 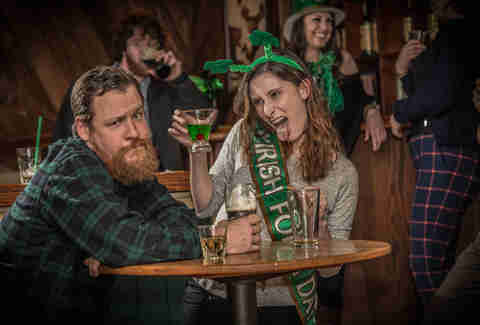 Actually, everybody dresses up in extremely stereotypical Irish attire and hits the bar to pinch strangers, scream, do fake accents, and drink gallons of green beer. 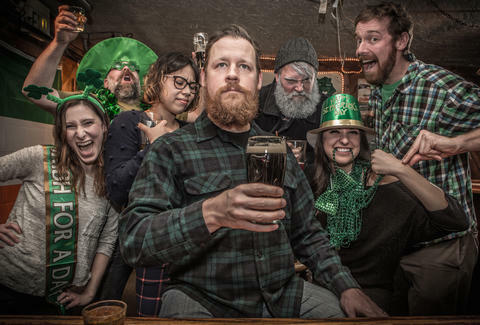 Chances are that even if you loathe it, you're going out for St. Patrick's Day. And when you do, you're almost guaranteed to see these people. Keep an eye on Erin. 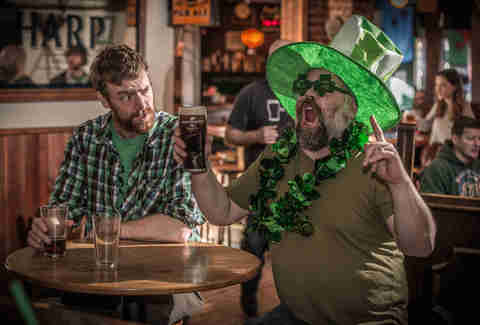 He would've been at this bar anyway, and is genuinely cool with people co-opting his culture on St. Patrick’s Day. Mainly because everybody buys him a beer because he has a red beard. But also, for pride. There are 600 people in here, so you’ll have to pardon the bartender if the cascade is off, or if the shamrock stamp isn’t as pretty as the one your barista put on your Irish cream latte this morning. She’s covered from hair to pinky toe in green spray-on glitter, and so too shall be some (lucky?) make-out partner at the end of the night. She looks like the unfortunate product of a tryst between a Twilight vampire and She-Hulk. It's not as appealing as it sounds. His “Shamrock-ed Megamix” includes a mashup of “Shipping Up to Boston” and “Jump Around” that sneaks in three lines of Boondock Saints dialogue before the beat even drops! He is ON IT. Like a sniper, he bears down on anyone not wearing green and pinches them. He’s been drinking for a while, mainly because HR reprimanded him earlier in the day. He came here alone, and will leave that way too. She refuses to wear any green, but her friends dragged her out anyway, and she's been drinking just to tolerate them. 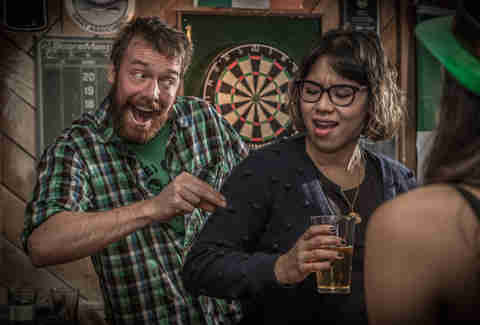 She's about to get booted from the bar for punching the pincher, even though he deserved it. Secretly she's relieved to be spending the rest of the evening with Netflix. Maybe Angela's Ashes will be on. Although participating in anything so co-opted by the mainstream is usually unthinkable, it isn't if you do it ironically! So he's just kidding about his Dollar Store Irish buttons and perfectly distressed vintage Pogues tee, and also kidding about the green beer he's drinking, and the fun he's having, and, well, actually it's kind of nihilistic and sad. He’s been here since the bar opened. Hell, he might have been here since it closed last night. And somehow, despite all laws of physics and human anatomy, he is stone sober. He can prove it by quoting Yeats -- but only if you buy him another double. She claims that she went to Notre Dame, and once made out with the leprechaun who runs out onto the field during games. But she actually just went to St. Mary’s, and once “experimented” with one of the Belles. Either way, it was a magical sophomore year. To her, St. Patrick’s Day is just Mardi Gras with more cabbage and fewer brass bands. 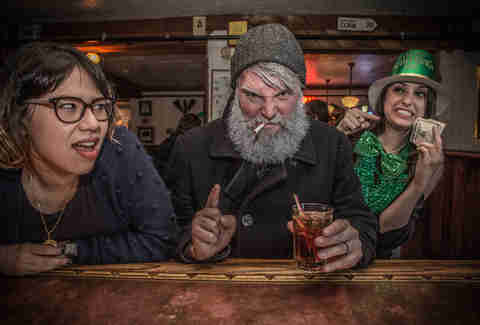 He can’t stop complaining about how he wishes he was in Southie, because Southie really knows how to do St. Paddy’s right, and you all drink like a bunch (loses train of thought and goes on 10 minute anti-Yankees rant). Eventually, he simultaneously wins and loses a fight... with himself. He can’t stop complaining about how he wishes he was in Chicago, because Chicago really knows how to do St. Paddy’s right, and you all drink like a bunch (loses train of thought and starts defending deep-dish pizza to no one in particular). He has told you about how they dye the river green seven times, despite your frequent insistence that, yes, you have seen The Fugitive. Eventually, he simultaneously wins and loses a fight... with gravity. Look, when you’re under 5 feet, 4 inches and out on St. Patrick’s Day, you’re really asking for it when you choose not to shave that red chinstrap beard. Though he still regrets getting it on the small of his back. He’s 45. He’s fun! And he’s wearing enough glitter and green accessories to be spotted from space. He has been at your table for an hour and hasn't figured out that you've never met. Nobody knows how they snuck into the bar, but they’ve already stolen at least five wallets -- and your heart! ... at least a month ago. Even weirder than his misremembering Matt Damon as an Irish guy is the fact that he’s been quoting Robin Williams' speech about his wife’s farts all day. That might have flown in your college bar, but probably not in the most authentic Irish pub in town. Murph’ll oblige you, if only to get your guard down. Then he will murder you. He really shouldn't be here today. Yes, Brian, we understand that U2 is Ireland's most prolific modern musical act and arguably the biggest band in the world, and that they've done more to help the sociopolitical landscape than most elected officials. But no amount of screaming is going to get this quartet of traditional musicians the bar hired to follow "The Fields of Athenry" with "Sunday Bloody Sunday," so maybe save your breath for something else... like explaining to your bartender why you made a donation to the One Campaign instead of tipping him. While we appreciate the effort put into finding an “Irish for a Day” sash at Walgreens, you’re allowed to drink today without pretending to be, like, 1/6th Dubliner on your Mom’s side. Nope. That’s the whiskey playing tricks on you. And those aren’t snakes running out of the bar when you scream at them. They’re potential dates. He decided to pack his own food coloring, just in case the bar didn't have green beer. What he didn't anticipate was bumping into people in a crowded bar, leaving green spots soaking through the pocket of his new jeans. It’s the one day a year when that step-dancing class her mom made her take at age 6 will finally pay off. And by “pay off,” we mean she’s going to have to pay for all those drinks she knocked over. He looks like he stepped out of a Scooby-Doo rogues gallery, and has been perched at the bar all night, telling strange tales of the sea. You can try to buy him a round to quiet him down, but it merely stokes his festering anger toward Poseidon. Get it? Her name is Erin, and she’s been screaming “Erin go Bragh” since she woke up. Daniel Day-Lewis? I Think? It's Late. Yeah, yeah, yeah. We know he retired after Phantom Thread. But did he? Because that older, well-dressed dude in the corner definitely looks like he made his own shoes, and the way he's talking and gesturing definitely looks familiar. Maybe he's preparing for a role as a normal guy who looks like a community college professor who hangs out in a local bar on the most ridiculous night of the year. Look at how he's slightly slumped over: The look on his face conveys years of career ups and downs, loves lost, and dark yearnings. His slurred speech is a mirror into his soul. Damn, he's great. That's totally him. His voice has grown hoarse, his face has gone pallid. But dammit, he's not leaving until at least eight people join him in a rousing rendition of "Tom Dooley." Actually, he is leaving, in a headlock and against his will. Just like Tom Dooley! Deep down they know it's been over for a while, but it took some day drinking and cry fighting in a bar while wearing novelty shamrock tees to finally break them apart for good. Or at least until April Fool's Day. Deep down they know they've been into each other for a while, but it took some green Jell-O shots and Van Morrison sing-a-longing to finally get them together. Had they gone for it earlier it would not have happened in front of several dozen friends, strangers, and bar employees. Their phones are dead. His phone is dead. The only friend he'll find tonight is a late-night burrito. Happy St. Patrick's Day! 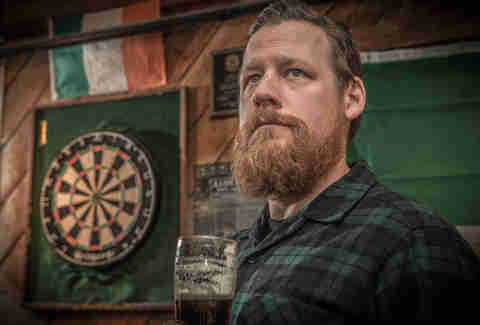 Andy Kryza is a senior editor on Thrillist's Food & Drink team, and is, like, one-fifth Irish. Follow him to the end of a rainbow: @apkryza.